This was especially nice to see, given their recent history after a 14-month lock-out which included Osmo Vänskä resigning because the management could not settle it before the necessary rehearsal schedule before a Carnegie Hall concert and recording date. You can read about it in the morning paper, here, and at the musicians' own blog, here. Fortunately, no one from the board or orchestra management was on hand to pick up the award which will now be delivered by mail. I'm curious who it will be addressed to. This was the second recording in a projected series leaving the remaining three symphonies in jeopardy. (Here is the earlier recording of the 2nd & 5th Symphonies at iTunes.) A very sad state of affairs, so there is an extra kick of Schaddenfreude in announcing this particular win. 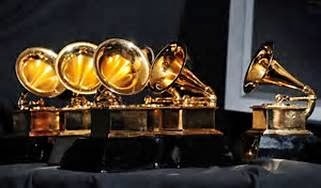 Congratulations, for what little it's worth, to the winners of this year's Classical Grammy Awards! P.S. Here's a thought-provoking article from Anne Midgette of the Washington Post, "The Classical Grammys (Remember Them?)" This is the script for the pre-concert talk I gave before the Harrisburg Symphony's January (Thaw) Masterworks Concert this weekend. You can read my posts on the orchestra's website about Michael Torke's Javelin, Bela Bartók's Suite from The Miraculous Mandarin and Johannes Brahms' 2nd Piano Concerto. One could say the same about musical styles, though it may take a decade or two to see real change, historically: whether the pendulum swings back and forth or whether it comes full circle is immaterial. The fact is, every generation since, say, 1700 (as a handy cut-off point) has decided the previous generation was yesterday's “old hat” and anything that needs to be said should be said our way, only to become tomorrow's old hat. Today, most of us are not that conscious of the difference between Haydn and Beethoven or even – at least aesthetically – Brahms and Wagner, lumped together with the Great Romanticists, who in real life were arch-rivals and at the opposite ends of the classical music spectrum. But in a period of a single concert, you can, however, experience several changes in this musical weather – all within a span of two hours. For some, a piece by Bartók could be the musical equivalent of the dreaded Polar Vortex which, after intermission, will be warmed-up by the sunny familiarity of Johannes Brahms. Or you might find the newness and even strangeness of the unfamiliar on the first half of the program exhilarating – the way people talk about “a bracing chill” – just as others might find something as overly familiar as Brahms (an old chestnut, to be sure: one of the Three B's, after all) capable of inducing “lazy listening,” unaware there could actually be another way to listen to something you're already well-acquainted with. If I tell you the first half of the concert is all-20th-Century, you may react one way – positively or negatively – just as if I tell you the second half is one of the great 19th Century Romantic war-horses (“oh, not that again!”). But if I tell you the first half of the program was written by composers in their 30s and the second half by a composer in his late-40s – does this change the way you might... think about what you'll hear? How many people in our audience are within this age-range of, say, 33 and 48...? ...How many here are older than 48? What if I told you Bela Bartók finished his ballet “The Miraculous Mandarin” when he was 38 but was still hoping for that first big break-through that would turn him into an internationally recognized “great composer” of the 20th Century? And what if I told you that when Johannes Brahms finished his 2nd Piano Concerto, he was 48 and at the peak of his popularity, having completed his 1st Symphony five years earlier and in between wrote his 2nd Symphony and the Violin Concerto? His 3rd Symphony was a couple years in the future. What if I tell you Michael Torke was 33 when he composed the first piece you'll hear tonight, called “Javelin”? He'd written a series of color-inspired pieces with titles like “Green,” “Bright Blue Music,” “Purple” and “Ecstatic Orange,” but he seems to have passed a little beyond his youthful popularity, now, even though he's still alive and writing – he's now 51, three years older than Brahms was when he wrote this concerto. It's a little early to question whether he'll be forgotten in the next decade – or if he finds himself on the comeback trail as he reaches a new maturity. He certainly writes very pleasant music – as one critic put it back in 1996, around the time “Javelin” was first heard and frequently performed, Torke writes "some of the most optimistic, joyful and thoroughly uplifting music to appear in recent years” – which is certainly saying something in the 20th Century. But, when we consider some of the music we consider “Great Art” – is being “pleasant” enough? Brahms' 2nd Piano Concerto didn't become a war-horse just because it has nice tunes. What if I tell you Michael Torke is one of a generation of composers who grew up listening to rock-n-roll and feels that is as much a possible resource for his own style as Leonard Bernstein devoured jazz or Antonin Dvořák absorbed the folk music of his native Bohemia? Brahms once signed an autograph book by writing down the tune from Johann Strauss' “Beautiful Blue Danube” which he signed “Alas, not by Johannes Brahms.” We think of Brahms as this big, stodgy, cigar-chomping man with a big beard, but he was a big fan of Johann Strauss who might be the equivalent of today's “pop music” back then. Brahms would often be found hanging out in the smoky taverns of Vienna listening to gypsy bands which were the equivalent (both musically and socially) of New York City's jazz clubs – and this gypsy music found its way into his concert music quite often: not just the Hungarian Dances but also the finale of the Violin Concerto, the one he started writing in 1878 just as he'd begun sketching what would soon become his 2nd Piano Concerto. And this Hungarian music Brahms loved and brought into the concert hall was not really folk music, as it's often considered. It's more like Urban Popular Music – the gypsies (who were not ethnically Hungarian) had a style of their own which has little to do with authentic Hungarian Folk Music, despite the popular perception of it, thanks to Brahms' dances and Liszt's rhapsodies. It wasn't until the early 1900s that Bela Bartók, himself a Hungarian nationalist, first heard what he realized was the authentic musical voice of the Hungarian people. He would quickly absorb this into his own style and create the voice we recognize as Bela Bartók. When Bartók began writing “The Miraculous Mandarin,” he was still virtually unknown: but there was another influence on his music, the economic and political realities of Europe, especially Hungary, after the 1st World War. And even if you've only followed the trials of the Crawley Family on Downton Abbey, you'll realize what a change this event made in the social fabric of the time – now, imagine what it did to the people who lived where these armies fought, who lived in countries that, after the war, no longer existed or, more importantly, like Hungary, hadn't existed before and were now faced with a whole new and blank chapter in their history. Once a more-or-less autonomous part of the Austro-Hungarian Empire – politically, maybe; culturally, not so much – what did they do, now that they were an independent nation? All these questions were big news around the time Bela Bartók read a story by Menyhért Lengyel about a trio of thugs, a young girl and the strange appearance of a wealthy Chinese man. Given the aftermath of the War, getting the ballet (or rather, pantomime) staged was going to be a problem so, meanwhile, Bartók went on composing other, more practical pieces. He didn't finish the orchestration until later and the full ballet wasn't staged until 1926 in Cologne, Germany, where it became a scandal, causing a riot that lasted ten minutes: it was closed down after one performance. As a ballet, it would only be staged two more times before Bartók died in 1945 – he never saw the work on stage. Shortly after that disastrous premiere, Bartók created a suite out of the complete work, basically the first two-thirds of the score, with a brief “concert ending” tacked on. This Suite received its first concert performance in Budapest in 1928, finally – ten years after he'd started working on it – with, ironically, Ernő Dohnanyi on the podium. With the Industrial Revolution, the Big City became an attraction for many young people – looking for adventure and success, looking, primarily, for a job. The Big City was exciting, teaming with humanity and endless opportunity – but many others viewed it with fear and loathing, feeling it was dehumanizing to the spirit and man's dignity. Its beginning—a very short introduction before the curtain opens—a terrible din, clattering, rattling, hooting: I lead the Hon[orable] listener into the apache den from the bustle of a metropolitan street. From there, we hear a theme that has, at its root, a folk song, possibly a lament, one way it represents the three thugs and then, with a more tender treatment, the girl. Cold and hungry (as Bartók often was himself during this time), they need money so they force the girl to stand in the window to attract a man to come upstairs – the plan is, then, they'll rob him. Sounds easy: what could go wrong? The long, unaccompanied clarinet solo – almost like a snake-charmer's chant – represents the girl at the window. Her first responder is an old man – we hear him trudging up the stairs as the thugs go and hide. She is repulsed by him and his pompous little shadow of a march underneath an English horn solo. When they realize he has no money, they throw him down the steps. She returns to the window and we hear the clarinet solo a second time. Her second respondent is a young student, shy, embarrassed, but she likes him and tries to get him to dance with her. But he also has no money and when the thugs appear, he runs down the steps and back into the street. The third “siren's call” becomes a little more involved but then her third responder makes his entrance to some terrifying brass fanfares in a pentatonic scale – basically, the five-note scale you can create by playing on just the black keys of the piano. This is the mandarin, a wealthy Chinese man, richly dressed – awesome if not exactly miraculous, yet. He stands in the doorway and stares at the girl. She is, understandably, terrified. But he doesn't respond to the girl who hesitantly begins to dance. Only eventually does she warm up to the task and only gradually does he seem to notice her. But instead he begins to pursue her around the room, in one of the great chase scenes in classical music. And why, basically, a Mandarin? Why not an industrial tycoon or an Austrian general, representing the economic or political enemies of Hungary? Why, in the language of the day, a "Chinaman"? 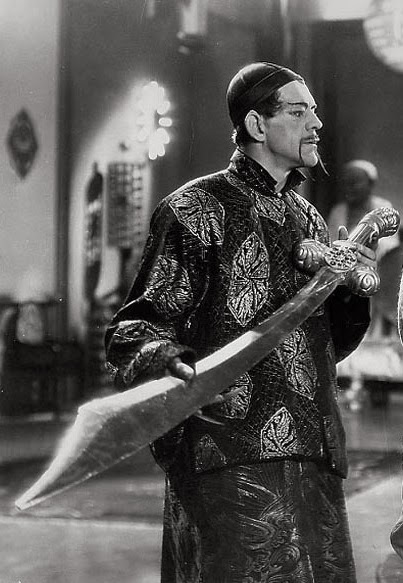 Keep in mind Western Europe was in the grip of the fictional villain, Fu Manchu, created in 1912 by the English writer Sax Rohmer with a series of novels that eventually would become a series of films. He invented the phrase "Yellow Peril" and the character's mustache alone was enough the conjure up the image of pure evil. But in Hungary, this dread of the mandarin's "otherness" is less brutal. There is a kinship sensed between Hungarians and Asians traced back to the arrival of Attila the Hun who rose out of Central Asia to forge a mighty empire that reached across modern Hungary from central Germany to the Black Sea in the 5th Century. The pentatonic music we associate stereotypically with Chinese music is also at the root of a great deal of Hungarian folk music. There is more in common between the aspect of the three thugs and that of the mysterious (if not yet miraculous) Mandarin who ends up as their victim. Basically, this is the end of the suite – but since the ballet continues for another ten minutes, I'll give you a run-down of the rest of the story: the thugs attack the Mandarin, knock him down and rob him but they can't get rid of him, so they decide to kill him. They smother him on the bed under the blankets. But he regains consciousness and starts chasing the girl again. Next, the thugs take a knife and stab him, but he doesn't bleed. Again, he comes to and again he goes after the girl. This time the thugs bind him, then hang him from the overhead light and he dies. When they cut him down, he comes back to life but the girl takes pity on him, caresses him – it is only then that his wounds begin to bleed and he actually, finally, dies. 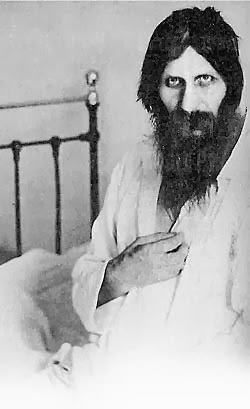 It's interesting to note that just a few days before Lengyel's story appeared in print, an event happened in St. Petersburg, Russia: the murder of the monk Rasputin who had had such a scandalous hold on the Imperial Family of Russia. The Empress hardly made a move without consulting her Rasputin who had prophesied that if he should ever be “separated” from them, the House of Romanov would fall. In December 1916, various patriots decided it was time to rid the tsar of Rasputin's control, and so the monk was offered cyanide-laced pastries at the home of Prince Yusupov, presumably eating enough to kill a man quickly. But after an hour, he showed no signs of illness. So Prince Yusupov shot him 3 times in the chest and back, penetrating his stomach, liver and a kidney. When Yusupov returned moments later to check the body, Rasputin opened his eyes and grabbed at the prince, pulling off an epaulet and trying to strangle his would-be killer. He got up and stumbled outside into the courtyard where Yusupov again shot him – four more shots were fired – and also clubbed him over the head till he dropped. There is a grizzly photograph of Rasputin's body with a bullet hole in the forehead – no doubt that stopped him... A couple hours later, Yusupov and his fellow conspirators dumped the body into the river. As Rasputin's prophecy foretold, only two months later the tsar abdicated the imperial throne during the first Russian Revolution in 1917. The second revolution occurred that autumn, led by the Bolsheviks who had the tsar and his family imprisoned and then executed in July of 1918. That summer, Bela Bartók began writing the music for Lengyel's story about a Mandarin who wouldn't die. According to Bartók's letter to his wife, he'd begun working on the music by September, 1918, but the 1st World War didn't officially end until the Armistice that November. The official treaty ending the war wasn't signed until late-June, 1919, around the time Bartók finished the first draft. There was a revolution in Budapest in October of 1918 – again, before the armistice but while Bartók was composing – which overthrew the autonomous government under the Austro-Hungarian Empire, forcing the Emperor Karl who had only just succeeded to the throne following the death of the old emperor Franz Josef in 1916 at the age of 86, who was also nominally the King of Hungary. So, with him gone as the de facto ruler of Hungary, by mid-November, just days after the Armistice, a Hungarian Republic was proclaimed. Hoping to remain neutral, the new nation found itself being invaded by its neighbors Serbia and Romania – but the United States and Woodrow Wilson had forced the disarmament of the Hungarian Army, leaving it with no defenses. By February 1919, unable to control popular dissent or manage the economy, the republic fell in a second revolution backed by Lenin and the Russian bolsheviks, forming a Hungarian Soviet Republic. But the communists had never been popular outside the big cities and so a civil war ensued in which the Hungarian Red Army murdered hundreds of scientists and other intellectuals – some 590, many in Budapest – between March and August of 1919, mostly led by a gang called “Lenin's Boys” who were basically street thugs roaming the city. Again, this was during the time Bartók was completing The Miraculous Mandarin. The Soviet Republic fell in early-August when Romanian troops captured Budapest. The Reds fled the city (escaping to Austria after looting the banks and taking numerous “national treasures” with them), leaving now the conservative, pro-royalist faction, the Whites, as the sole fighting force, who managed to defeat the Romanian Army. But with no police force or national army, chaos ensued under the “White Terror” which lasted for almost two years and which aimed much of its anger against the Jews whom they blamed as supporters of the previous communist regime. A former Austro-Hungarian admiral took charge of the Whites, formed a national army, tried to restore order and created the Kingdom of Hungary with himself as “Regent.” However, no one wanted the actual former Austro-Hungarian emperor as king nor could they find another likely candidate, so somehow Admiral Miklós Horthy served as Regent – that is, royal place-holder as care-taker – until he was ousted by the invasion of his former allies, the German Nazis, in 1944. By that time, Bartók managed to flee Budapest for the West and eventually New York City, but that's another and longer and even sadder story. 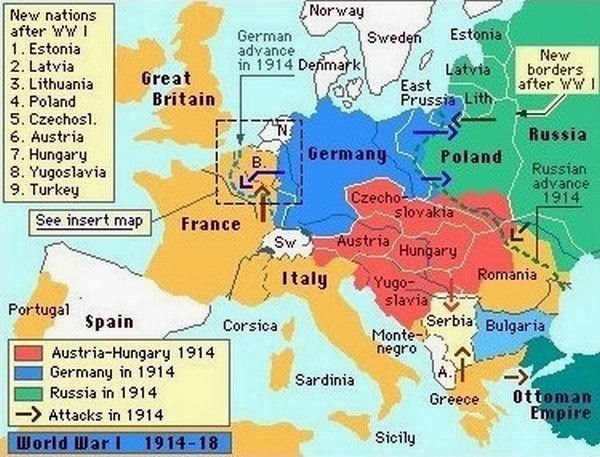 Meanwhile, in Paris in 1920, the Western Nations carved away at Hungary, slicing off some 72% of the original country and giving it to Romania, to what would become Yugoslavia and to the new country of Czechoslovakia as well as to what was left of Austria, once a vast empire sprawling across central and eastern Europe, now this small land-locked nation, a shadow of its former self. These divisions were done along ethnic and linguistic lines rather than political and historical lines – but from the standpoint of a Hungarian, it was humiliating, and now almost 3½ million ethnic Hungarians no longer lived in Hungary. Bartók's hometown was now in Romania; the largely Hungarian village where his family moved after his father's death later became part of Ukraine; the city he grew up in was now in Czechoslovakia (and presently in Slovakia). 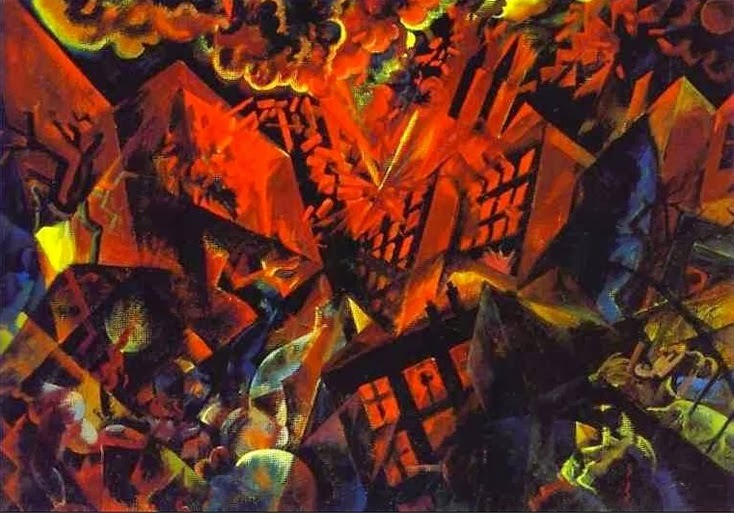 So perhaps this brief summary of the historical background with its political and social turmoil not to mention the economic instability during the times when Bartók was composing The Miraculous Mandarin might give us an appreciation for the violence of the story and the music he wrote for it. Harrowing music from harrowing times. Johannes Brahms had died in Vienna about 20 years before Lengyel's story of the Miraculous Mandarin. Generally, Brahms had a fairly dull life as great artists' biographies go, and he was fortunate to live in a fairly stable society both politically and economically. He was, by the time he composed his 2nd Piano Concerto, at the height of his fame – his conductor friend Hans von Bülow had already coined the Three Bs, Bach Beethoven and Brahms – plus he was quite well off, enough so he could set royalties aside for a secret fund to help his old friend Clara Schumann, who wasn't having that good a time of it toward the end of her career as a solo pianist. The day after Brahms premiered his new Violin Concerto, Clara lost her youngest child, her son Felix – she had been pregnant with him when her husband Robert had attempted suicide only five months after a 20-year-old Brahms had introduced himself to them. Brahms' 1st Piano Concerto in D Minor had started out as a theme sketched a few days after Robert Schumann threw himself off a bridge into the River Rhine. Now, Clara was celebrating her 50th year as a concert pianist but arthritis, hearing issues and the failing health of some of her children made it difficult for her – for one thing, she found she could no longer play Brahms' D Minor Piano Concerto. She would never accept outright charity but somehow, through his publisher, Brahms managed to see Clara would get a steady income she thought was from her husband's music. In April of 1878, Brahms and a few friends of his took a vacation – not a tour, just a trip, tourists in the sunny land of Italy, the first of nine such holidays he would take there – the only country he visited purely for pleasure. It was there that he sat down and sketched some ideas for a NEW piano concerto – but the next month, when he began his summer's composing, he put it aside to write a violin concerto for his friend Joseph Joachim which was premiered on New Year's Day, 1879. Brahms was often one to keep his work to himself: during the summer of 1880, he composed two piano trios, one of which never saw the light of day, as well as some piano pieces, the 2 Rhapsodies, Op. 79, and the 2 overtures – the “Tragic” and its companion, the “Academic Festival,” musically the equivalent of the theatrical masks of drama and comedy. He also was working on a new piano concerto. Before he finished it, there was another trip to Italy in April, 1881, where three friends had trouble keeping up with him, he was enjoying himself so much. 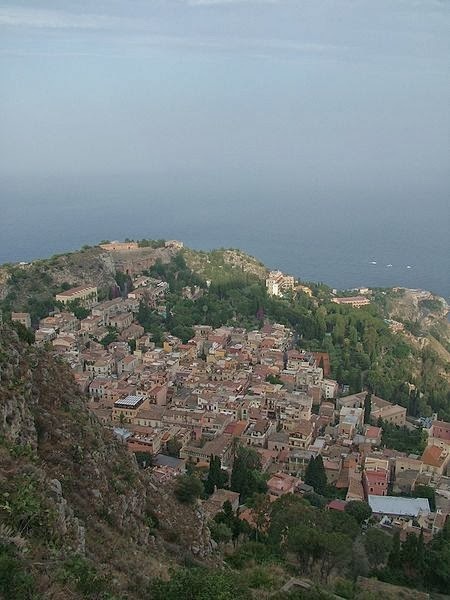 His doctor friend, Billroth, wrote that one of his favorite places was to stand on the cliffs overlooking the village of Taormina on Sicily, in the shadow of the volcano Mt. Etna, and gaze out over the sea and he found the wine of Venice so much to his liking, when a fan recognized him on the street, he was enjoying himself so much, she had to grab his arm to keep him from walking off into a canal. It's an interesting image to keep in mind – this idea of Brahms the bon vivant enjoying himself in Italy – during the last movement of the concerto, which if it doesn't paint musical images of the places he visited, gives us an idea of how he felt when he was there, certainly one of the happiest times in his life. A few months later, then, Brahms announced to his friend Elisabeth von Herzogenberg he'd completed a “tiny concerto with a tiny, tiny wisp of a scherzo.” Now, if you know the piece, it's hardly tiny – in fact, at about 50 minutes, average, it's probably one of the longest concertos in the standard repertoire. A scherzo, which makes this a four-movement concerto rather than the typical three-movement form, is usually a light-hearted dance-like movement (it means “joke” in Italian), but this one is neither “tiny, tiny” nor a “wisp,” but a full-throttle drama with a full-bodied dance in the middle to... sunshine? Or wine, perhaps? Brahms explained he felt the first movement was so “harmless,” it needed something passionate between it and the slow movement. We know he'd originally planned for an added scherzo in the violin concerto – so this is where that idea (if not the music itself) ended up. 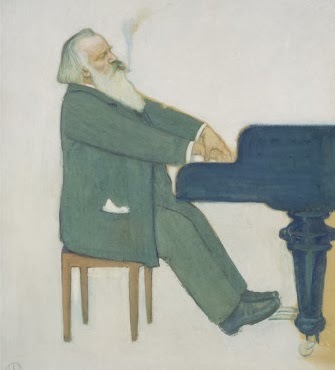 Brahms, of course, would often have his little self-deprecating joke about his music – not that he was ever modest about it (in fact, he could be one of the biggest jerks in classical music when it came to that). But unlike the D Minor Piano Concerto which had been a failure at its premiere in Leipzig – where barely three pairs of hands started to applaud before the hissing began – this new concerto was a huge success and Brahms quickly took it on tour both as soloist and as conductor (he and his conductor/pianist friend Hans von Bülow often traded places on the stage). Clara Schumann wrote in her journal that “Brahms is celebrating such triumphs everywhere as seldom fall to the lot of a composer,” not easy for her to admit, given her own husband's lifetime of neglect. The spring before he'd first sketched the concerto, he was given an honorary doctorate degree and was even offered the job as music director of the St. Thomas Church in Leipzig, where he would've become the successor to Johann Sebastian Bach – an honor he quickly turned down, however (imagine, the city where, 19 years earlier, they'd hissed his 1st Piano Concerto!) – but Clara also knew him well enough to know that whatever his triumphs on the world's stage, in reality Brahms lived a sad life... and always would. So in the condensed period of one evening, you can explore three different musical eras and worlds – stylistic, personal, historical... Starting with Michael Torke's javelin-like rise to what promised to be an exuberant career (“Javelin” is, after all, only 20 years old) – to the dystopian dysfunction of a world of violence and inhumanity in Bartók's “grotesque pantomime,” to some of the happiest music a lonely man could ever write at the peak of his career.